I have seen some amazing lighting fixtures lately and thought I’d share some that I love. From girly and light, to slightly modern, to just plain amazing (but out of many clients price range.) There is no price constriction when you are just plain enjoying the view. To keep myself on track I thought I’d just focus on one color and its many different ways of being featured on a chandelier. Turquoise…ah turquoise! Is anyone else kind of in love with this color? This adorable chandelier is actually a vintage piece that got a new lease on life. It’s amazing what a new coat of paint can do to a chandelier. Look at your local antique, consignment or even GoodWill stores for these pieces…but look past their current exterior and just imagine what they can be! This chandelier is whimsical and modern at the same time. The geometry of the repeatitive disks could add such a fun focal point to a room with clean lines and light colors. At a price tag of only $129 why not do three above a changing table as a mobile and decorative lighting…hey, thinking outside of the box is way more fun. Now this beauty is the show stopper…how amazing is it? Now, it may not be your taste, but you have to admit if you walked into a room and this was hanging in the middle of it, you’d kind of have to stop and stare! 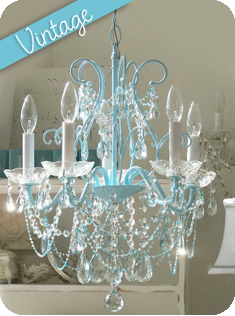 And lastly, here is a room that was featured on Project Nursery that shows just how fun a turquoise chandelier can be. I'm loving it, too! Robin's Egg blue has always been a favorite of mine, too. Such pretty images you have put together here.! Love it!